The hanging ceiling systems, suspended signage are a useful tool in showing visitors to your location how to get to different areas and identify different rooms at your business. The (2) sign holders display 105 x 400mm graphics, providing plenty of room to create eye-catching, highly visible graphics for visitors to easily read. There is a protective lens with each sign display as well, keeping graphics looking neat with cleaning being an easy task. The included suction cup tool makes removing these lenses easy as well. 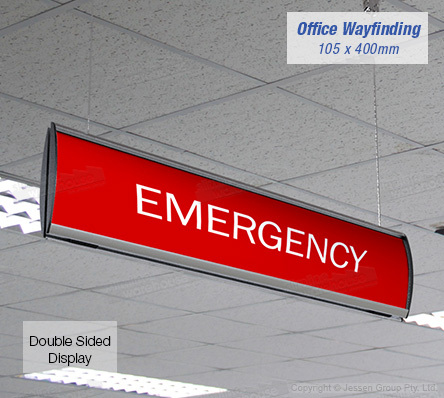 This suspended signage has everything you need to install quickly onto most ceiling surfaces. The hardware kit attaches the signs together and to the nylon line that hangs down from the ceiling. The wayfinding display has 4m of nylon line that can be cut to size in order to work best with your location size. The dual-sided displays communicate information to visitors at exhibition halls, retail stores, shopping centres, office buildings, transit stations, airports, universities, and more!